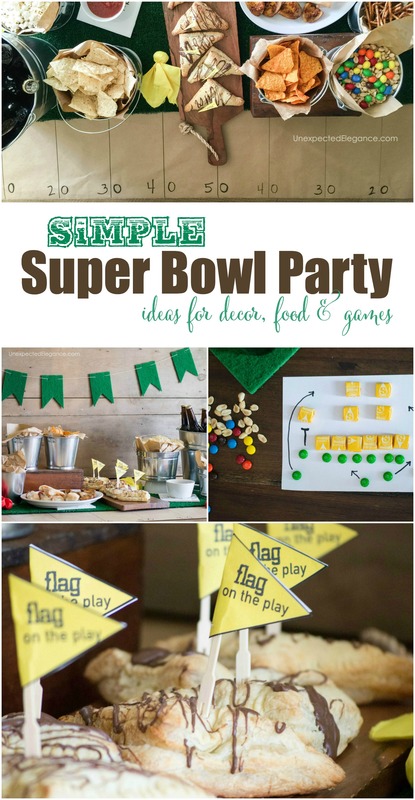 Get all the ideas for food, decor, and games that you need to host a great SUPER BOWL PARTY! Everything is one place and EASY to throw together. There’s been a bit of football frenzy happening in my house these past few weeks. The BIG Game is coming up and the play-offs have my husband very excited…if he isn’t watching a game, he’s listen to commentary on the subject. 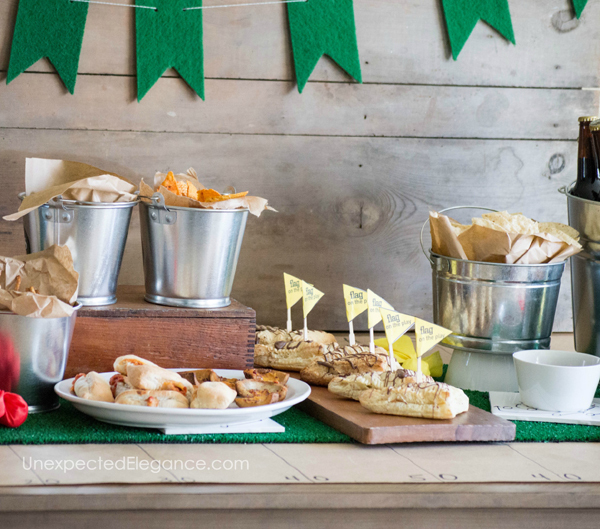 I’m not a huge football fan, but I do love to throw a party, so any excuse is good for me! I’m looking forward to getting together with my friends and enjoying a fun night together. As I always say, parties should be SIMPLE. You don’t have to spend hours on food and decor. Sometimes simple is better. It will give you time to relax with your friends during the party and you won’t be so stressed out right beforehand. 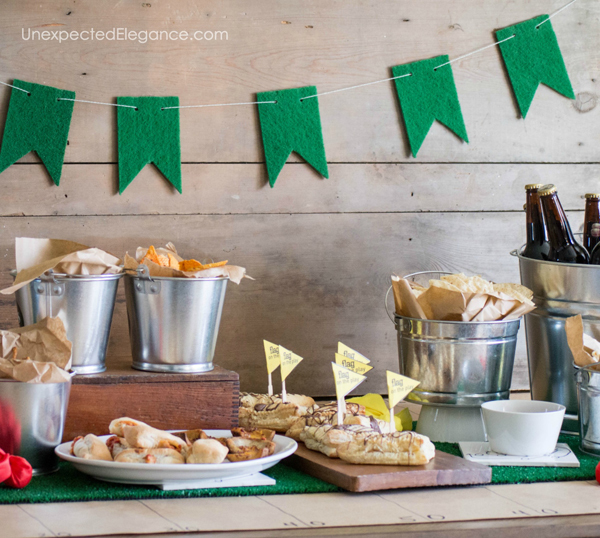 A few easy tricks I use for almost any party is gathering items from around my house first. Things like small boxes or white bowls, turned upside down make it easy to add height to your table. With a little planning, you won’t have to purchase things you already have, and that will save you time and money. My biggest suggestion (and one I mention OFTEN) is to use brown craft paper for your table runner. I have a 10 minute tutorial for turning that simple craft paper into a football field, HERE. I also made a 5 Minute “turf” banner for around $5 using green scrubbing pads. Food is another area where you can save time. Buying store prepared food or items that are pre-made is a GREAT way to save your sanity and help with the stress of throwing a party. I often get sandwich platters from Target’s deli. They are delicious and very reasonable. 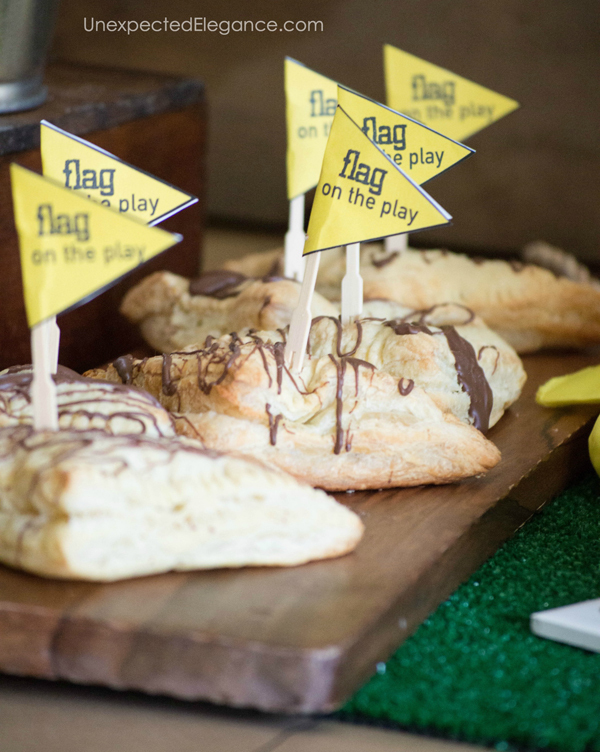 These SNICKERS Turnovers would be a great addition to your Super Bowl Party. 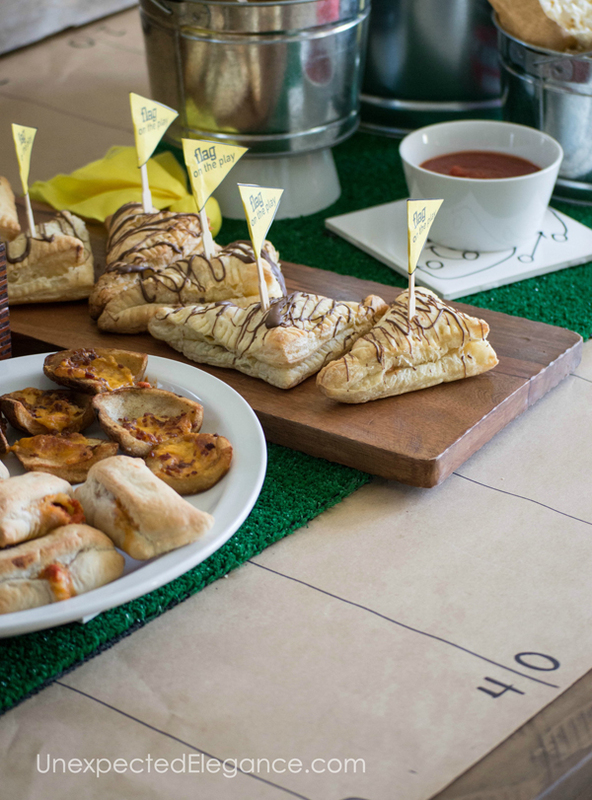 A “turnover” is a fun play on words for football but they also reminded me of flags. Defrost the dough according to the package instructions. 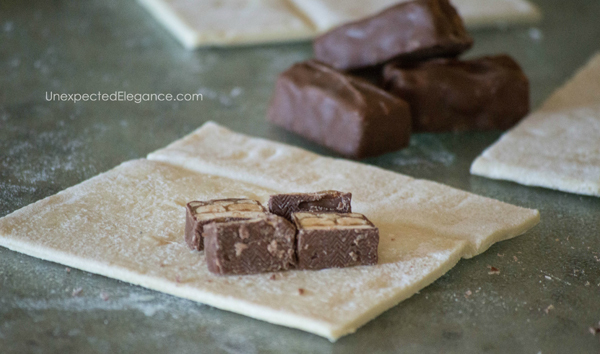 Cut each sheet of dough into four squares. Chop up one fun-size Snickers bar and place inside one of the squares. Fold over from corner to corner into a triangle shape, and press edges together to seal using a fork. 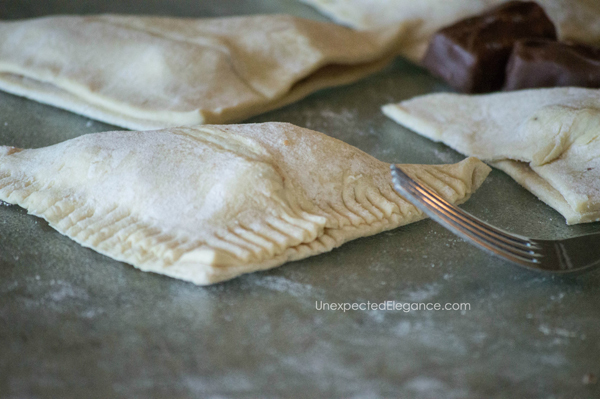 Place turnovers on a baking sheet, leaving about 1 inch between them. Then bake at 350 degrees for 12-14 minutes. 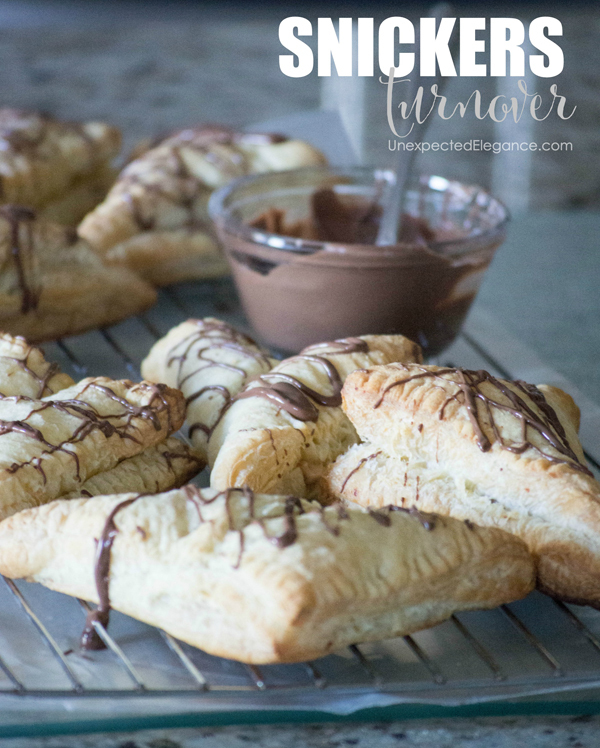 Let cool, then melt a few morsels of chocolate in the microwave and drizzle over the top of each turnover. Another extremely simple food option for the party is a mix. 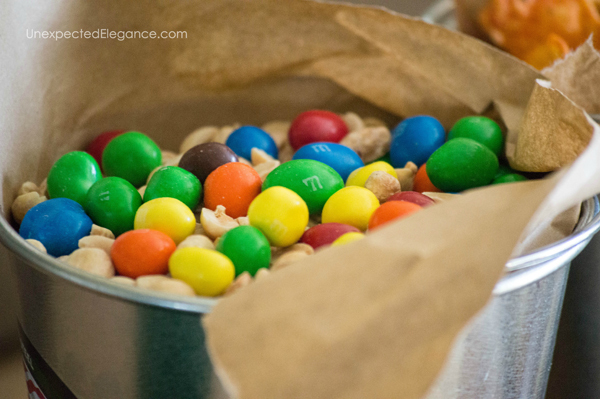 Just add your favorite candies and nuts. 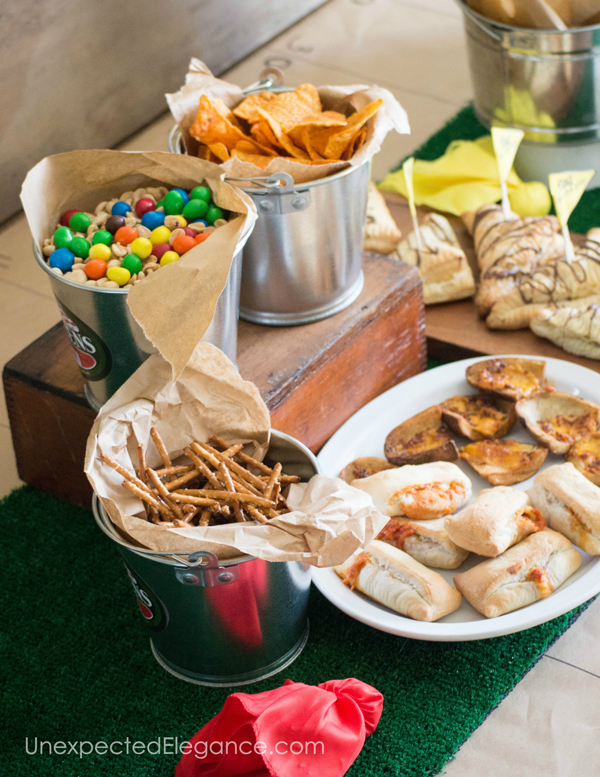 Have cute bags available for them to mix the ingredients in and they can eat while they watch the game. 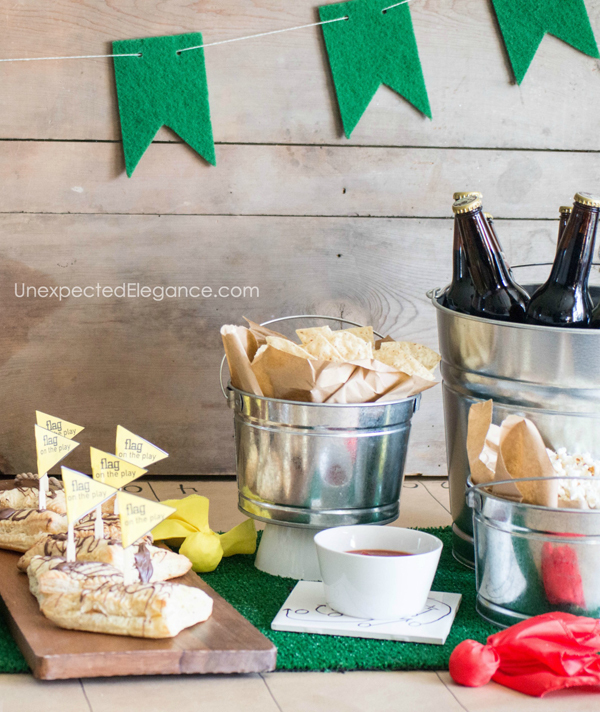 If your party is not an adults-only gathering, then you might want to have a few things to keep the kiddos entertained while the rest of you watch the game. Something as simple as having a few penalty flags available might just do the trick. Have the kids watch the game carefully and see who can call the flag first. 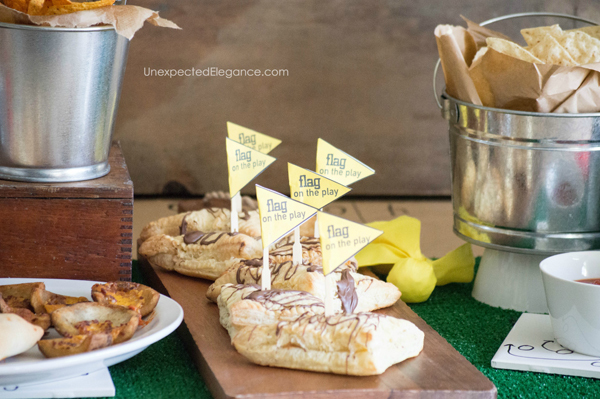 You can make a ton of yellow flags for around $2. 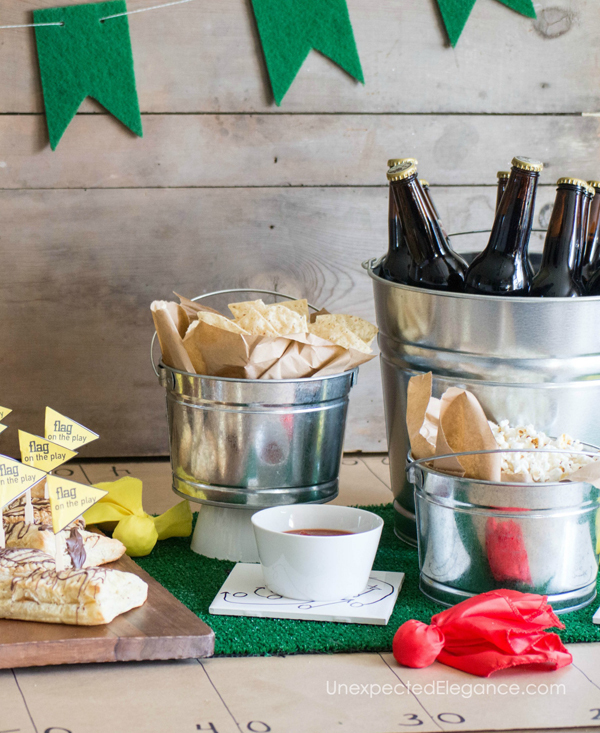 Just grab a yellow, plastic, inexpensive tablecloth, a bag of cotton balls and some twine. Cut pieces of the tablecloth, add some cotton to the center, then wrap it up and tie with some twine. These are soft and nobody is going to get hurt if “throwing the flag” gets out of hand. You can also add them to your table as part of the decor. 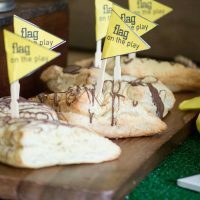 If throwing flags isn’t enough fun for you, try this “Name That Play” game. 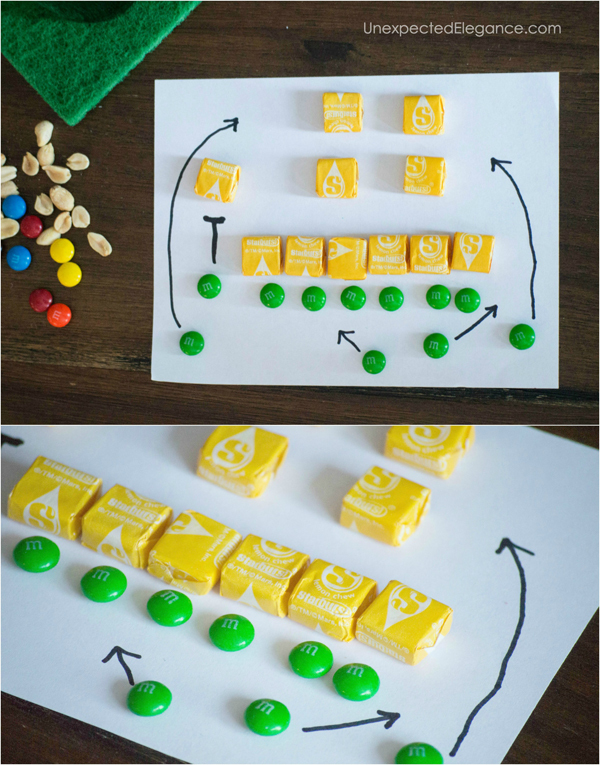 You just need a piece of paper, 11 pieces of larger square candy (like Starburst), 11 M&M’s ( or Skittles) and a marker per person. You could even turn this into a tournament. Have two people match off at a time. Just announce the plays and players for each round. You could make the “play-off” be for the first possession of each team per quarter. First person to get it right wins! Games are fun for the kids, but some of the more serious sports fans might not appreciate the commotion. If you have space, it might be a good idea to have a TV set up in another room specifically for games. AND for those of us who are just there to socialize, have a Commercial BINGO game ready. 😉 You can Google it and find a bunch of different options. 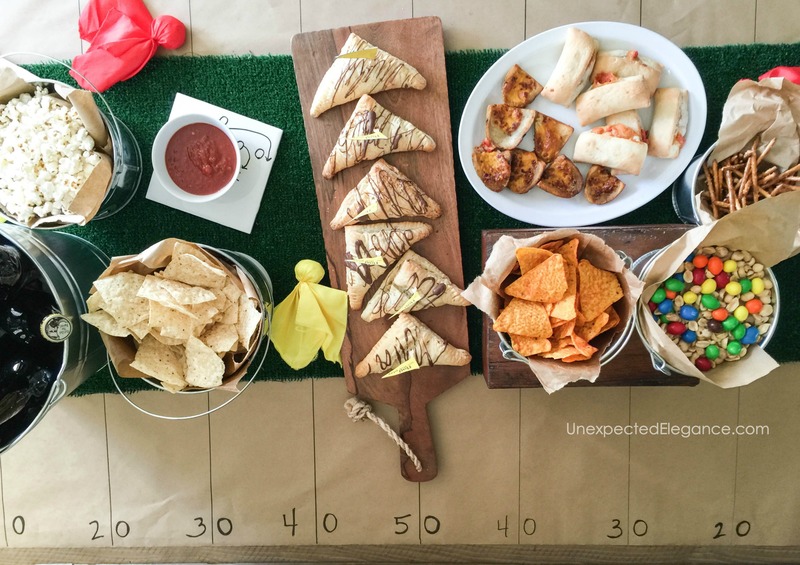 Are you hosting a Super Bowl party this year?? I’d love for you to share any tips you have for making it simple and fun!